AttorneyGuide.com™ is the only online directory offering an exclusive group of attorneys with proven honesty and integrity. AttorneyGuide’s primary objective is to ensure that people who need an attorney in Nevada can find legal assistance from a source that they can trust. We are here to help and educate the public and will only refer them to attorneys devoted to honest representation. 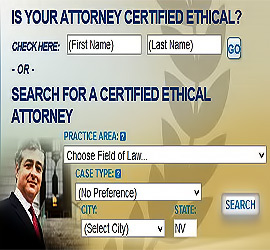 “AttorneyGuide.com™” and “Certified Ethical™” are registered trademarks of AttorneyGuide.com, LLC.